Hmmm, I really wanted to spend some one-on-one time with Stephanus and Joy Venter, but they are busy kids—he’s a musician and she’s a swimmer. Well….maybe I could do the hated drive to Nakuru, once again taking my life in my hands. My friend Agnes Mwamburi, who lives in Nakuru, had said she would come visit me on Saturday. Aha! The two-birds-with-one-stone excuse! Oh, yes, and I could pick out some more of their taka taka earrings. AND Fr. Kiriti was in Nakuru. This would be the perfect opportunity for him to meet these folks, whom I knew he would love. Not just 2 birds, but 4!!! “Hi Lydia, I’m thinking about coming to Nakuru on Saturday to spend some time with the kids. Would that be convenient?” Lydia never says no to anything, I’m convinced. So after delivering a packed suitcase to Mary Fry’s hotel down by the lake—so her friend, Nora, could take it to the US on her 2-suitcase allowance, I struck off for Nakuru, this time not going out of town the wrong way! I’m getting to be such a big girl! The road was jammed with the usual snails disguised to resemble trucks, dare devil matatus, and speeding private cars, jockeying for position to overtake the trucks at the first opportunity. I confess to being part of that contingent. No donkey carts on this road. It takes about 1 hour and soon I was approaching Nakuru. The Venters live on the close side and I thought I would recognize the turnoff and did—about 10 feet too late. ARGH! I had to make a u-turn on that busy highway. Wait, wait, wait, “Oh, yeah, here’s a chance. NO!!! !, that piki piki shot in front of me just at the wrong time. Wait, wait, wait. Now? No, not enough space. Wait, wait, wait. OK, NOW!” Well, that wasn’t much of a nail biter for my plucky readers. Obviously I made it or I’d be writing this from my cloud! The turnoff is a hairpin, narrow, rutted and lined with small shops. “Oops, can’t go empty- handed.” It’s not done here and besides, they have fed me and whoever happened to be with me several times. They have 9 mouths to feed, plus the menagerie—dogs, rabbits, LARGE lizard, snakes (they’re very small and eat only eggs). What I didn’t know is they have now added a cat, although Lydia was an avowed cat hater—until tiny, black “Tiger” wormed her way into Lydia’s heart. She was given to one of the small boys who immediately HAD to have her. Lydia bit her tongue and agreed. Now Tiger gets the pick of the kitchen leavings and is beloved by all-particularly since she has caught and consumed 2 rats. She’s not much bigger than a rat herself. I stopped at a tiny shop to purchase tomatoes, carrots, shelled fresh peas, and a popo, local lingo for papaya. I was greeted by Bella, the small dog and the frantic barking of the big dogs, fortunately penned away during the day. All the kids came to give me big hugs, and of course Lydia and Wilco. It seems like we’ve known each other for years. They’ve moved the taka taka earring “factory” to a small outbuilding just outside the kitchen door. 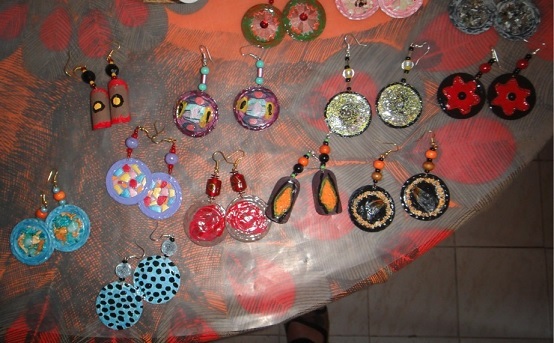 There I found more delightful earrings, but not very many I and teasingly complained that she’d been selling my merchandise to others. It’s wonderful how they practically walk out of the house. Everyone who sees them immediately loves them, all the more after they learn they’re made of flattened bottle tops. Joy, in addition to being a swimmer, is a pastry baker par excellence. She was preparing a South African delicacy, while I observed the process. First a flaky dough is pressed into muffin tins (not the ones the earrings are baked in, I was assured). Stephanus played sous chef for this job. They were then filled with a dab of apricot jam and topped with a mixture of beaten egg white and coconut. These are baked in a very tiny oven but they came out perfectly – which seemed a miracle to me, who burns everything if I don’t use a timer. Lydia claimed a bit of oven time to bake some yummy rolls, while making a hamburger stew and a salad. As we waited dinner, she must have noted I was salivating over Joy’s goodies, b/c she murmured into my ear, I think you could taste this one. It has a bit of a flaw in the crust. The crust looked perfect to me but you can be sure she didn’t have to offer twice. Oh, my, a taste of heaven. Just a perfect 2 bites. She said someone had ordered a dozen from Joy’s Delights, her part-time bakery business, and since the recipe made more, she thought Joy would send me home with some extras. Plus, we each had one for our dessert. What a treat to be with them. Just as we finished, Fr. Kiriti called. He was given instructions to the turnoff and Wilco sped off on his mini motor bike to lead the way back to the compound. Like me, Fr. Kiriti was immediately charmed by the family, minus the snakes, for which he has no love!!!! He toured the earring factory and saw the other imaginative items they make. Then Agnes called to say she was at the junction (which we assumed was the same turnoff). “I’ll go get her. Kiriti, go with me, I want you to drive the car to see whether you think it’s OK”. (He’s very fussy about his cars.) Off we go to the turnoff. No Agnes. “Agnes, where are you?” “I’m at the junction.” “I’m at the junction, too, but I don’t see you.” I hand the phone to Kiriti and they animatedly converse in Swahili. “She’s down at another junction,” as he swings onto the road. He spots her on the other side of the road and now it’s his turn to make a u-turn. He, too, is finally successful and while we’re getting there he says, “Margo, I think there are 2. No, 3, now 4 of them!” To myself, “Wait, she’s spending the night and I have 2 bedrooms.” ACH! This is going to be interesting. Moreover, I had some stew left over from Wednesday night when I’d cooked for an army (Catherine and her 3 children). I’d fed Kennedy with it the next night and still had enough for 2, but definitely not for 5, 3 of whom were healthy young folks with healthy appetites. Think, Margo! Back in the Venter’s compound, tea was ready. Fr. Kiriti took off, claiming he needed to meet with the priest in his home parish to arrange a mass to celebrate, then prepare his sermon. I was indeed presented with some of Joy’s delights. We said our goodbyes, and all 5 piled into my car. On the way, my head was problem-solving. Aha, I’ll fix hamburgers—no cheeseburgers—American style. Back in Naivasha, I pulled into the parking, handed Agnes some money and pointed her in the direction of the butchery across the road for the minced meat, while I headed into the Naivas to see what I could find there. Yes, they had buns that would do nicely, catsup, even pickles and mayo, but no lettuce. Oh well, this would have to do. Turning into the church compound, I parked again and we crossed to the outdoor market where I bought tomatoes, carrots, watermelon, bananas, popo, and cucumbers. Finally at home, I put everyone to work in my small kitchen. “Here, you get to scrape the carrots and cut them into strips—like this. You can do the cucumber strips, you get to make the hamburger patties—like this, thin. You get to make cheese slices, you cut the buns, you slice the pickles,” (which turned out to be sweet, not dill) and I tried to light the broiler—no luck there, it went out the minute I closed the door. Oh, well, I’ll try the toaster. Hmmm, the tops are too thick and burned a bit, but we made do. Two of the younger set were Agnes’s son, Musa (form 2) and her daughter, Fatima (form 4). The third was Joy, a university student doing an internship with Agnes’s organization. They were all delightful, everyone joining in and being very observant of the process. My pan held only 3 at a time, but finally all the food was ready and we sat down. They loved the hamburgers! 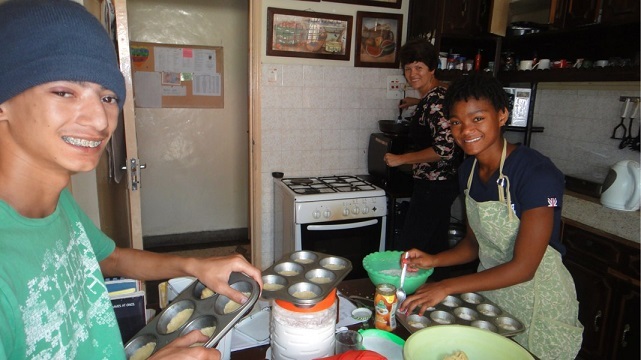 Agnes is so busy with her women’s groups and her peace and reconciliation committees that the kids often must prepare the evening meal. They declared that hamburgers would definitely be added to the menu. Right in the middle of dinner, someone came bursting through the door. 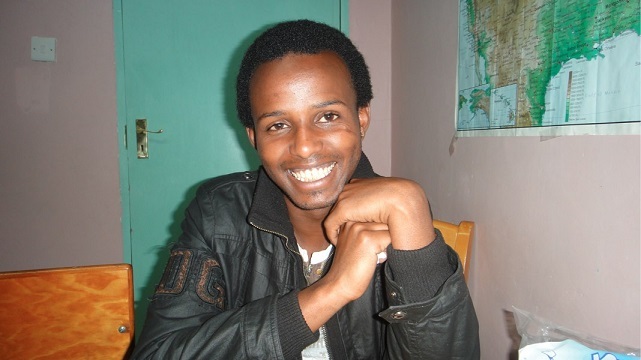 It was Cyrus!—oldest of the Mji Wa Neema kids, now a 22-year old second year medical student. He had come down from Nairobi to see me, but seeing I had guests, withdrew until later. It was lots of fun, kind of crazy, but great. Agnes talked about her P&R committee and having had a meeting with judges and all sorts of bigwigs. Evidently the kids had not realized what major work their mom has been doing. She thanked me later, “My kids now have a much better understanding and appreciation of their mom’s work.” After dinner the kids cleaned up the kitchen, the dishes and even mopped my floor, while Agnes and I repaired to my tiny bedroom, where the only place to sit is my bed. I leaned against the headboard, while she lay at the foot, head against the side wall and we began to catch up. She is one tough lady and is fast becoming SOMEBODY in the P&R world. She was so successful in reducing the tensions in Nakuru in the last election that she has now been asked to come to Naivasha to work her special magic here. “It’s too complicated to explain all she did, but I was greatly impressed with her perseverance and her creativity in addressing a very complex situation. The kids were welcomed in the orphanage. Many of the residents are home with extended families for the August break so there was plenty of space. I had had no time to put sheets on the bed in the other room for Agnes, so I left them for the kids, who manfully (womanfully?) did that chore, though they must have thought I was a very strange hostess. Agnes and I might have gone on all night if Cyrus hadn’t texted me, “Are you guys finished yet?” Agnes was tired anyway, so I got Mom and kids all squared away. Then Cyrus came in for our annual talk-fest. I am his sho sho (grandmother) and he always comes to share his year, the struggles, the successes, his dreams and his agonies. He will be finished in a couple of years, then hopes to get an internship in the US. When I mentioned I live close to Stanford, a 10-minute bike ride, he got very excited. Then he got REALLY excited when I reminded him that one of his sponsors works for Genentech. He is very interested in pharmacology and hopes to specialize in something, the name of which I can’t remember pharamco-something-or-other. Dreams are wonderful and I do hope he can realize his. He’s a great guy, bright, passionate about medicine, idealistic and wanting so much to move his country forward in whatever way he can. You are tired and so am I, but this story goes on and on—more visitors. Will need to write part II, “Son of Visiting and Visitors”, tomorrow. Otherwise this will be a book, not a blog!